Alhaurín el Grande is located in the province of Málaga it covers an area of 73.1 km2 extending from the northern slope of the Sierra de Mijas and the plain of the Guadalhorce river, where alternate crops of citrus and other fruit trees orchards are found. The town situated between the river Fahala and the stream of Blas González. The coast is close by and there is a network of roads to get there. There is a road to Málaga Airport and Torremolinos, which takes about 30 minutes by car. A new road was built in 2010 connecting the town with Fuengirola and the beach which is only 20 minutes’ drive. There is also another new road to Marbella, to the southwest with Mijas just along a winding road round the mountain. From Alhaurín there is a view over the “Hoya de Málaga”, Málaga’s vale, full of lemon trees and other fruit trees. Some traces of the village’s ancient past have survived. There is the 12th Century Moorish archway, the Arcos de Cobertizo. In the small plaza in front of the town hall, the Plaza del Ayuntamiento, are three Roman columns which were discovered close by at Fuente del Sol. 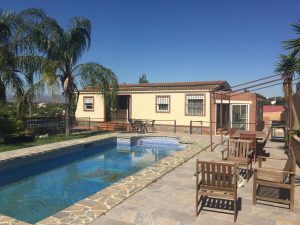 The properties for sale in Alhaurín el Grande are significantly less expensive than those on the coast, due to this it’s very popular with people with a limited budget. There is a good mix of different types of properties in the town including villas, townhouses and apartments. We are always looking for new rent to buy properties in the town to meet the high demand from our clients.